The New Crewel: Embroidery Book Give-Away! Yesterday, I reviewed The New Crewel by Katherine Shaughnessy – and today, I’m giving away a copy! Wouldn’t you like your own copy of this fun little book on contemporary crewel embroidery? If you do, read on! 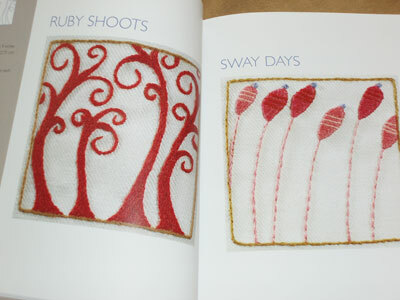 The New Crewel is a great little embroidery book that focuses on contemporary embroidery. It’s full of little (sometimes, tiny) crewel embroidery projects that are modern and kind of swanky, some a bit funky, but all rather fun. It’s true that the designs may not cater to everyone’s embroidery tastes, but I think it’s a neat book for those who like a minimalist, modern look. It would make a great gift, or a good project book for your own bookshelf. If you’d like to win your own copy, here’s your chance! 1. The give-away is open to everyone, anywhere. If the winner lives outside the US, I’ll ship it using the least-expensive air mail option. 2. To enter, you must leave a comment on this post, on the website. Please do not respond by e-mail, and please do not leave entries on other posts on the website. You’ll find a “click to comment” link at the end of this post, on the website. What do you like best about this book? 4. Please make sure you leave a name in your comment, even if you comment anonymously, so that I can announce the winner by name. 5. Entries will be taken until 5:00 AM (CST) Monday, April 19th. I’ll announce the winner on Monday, and the winner will need to contact me with mailing information. April 19, 2010 The New Crewel – Winner Announced & Happy Birthday! April 11, 2012 Crewel Twists – Book Give-Away! Will I be the first. :). Love this book. and especially the design on the cover. It really appeals.Cute and quirky. And thanks for the oppurtunity to win. I love crewel work and I would have to start a new project for my embroidery group…this book can help me!!! I learnt a lot from this site. If the book is available i can do further works in embroidary. Anyhow if i am not getting what your idea of give away is fentastic. Hello, hace muchísimo tiempo que te sigo, adoro tu blog y que mejor momento para dejar un comentario que ahora, me encantaría tener un ejemplar de ese libro, lo que más me ha gustado de el son las formas y el colorido que utiliza en el bordado. Mi nick es Hartasu, vivo en Spain. Actually this is a book I've been eyeing for a long time on Amazon. Why? Well I like the strong graphic design alot and all the shots you showed were something that I think are really bright and funky.Thanks for highlighting it as your giveaway. I think this book has easy projects so it's a good book to offer to my daughter – she can do a good use of it with my granddaughters, and now and then she can lend it to me. You always have the best give-aways. I love crewel, but usually stick to the very traditional patterns. This book lots outside the box. It would be fun to stich-up a couple of small project to see if I can break the traditional rut I'm stuck in. Hi, Mary! Thanks for another book give-away! What I like best about this one is that we can learn crewel with small, fast projects! I have the bad habit of making too big projects that never end (I'm working on it!). And it's nice to have a modern look on such an ancient technique – even though I do like the classic patterns, it's good practice to look at embroidery in a modern way. I'm a newcomer to crewel embroidery and need to learn the basics. I'm particularly attracted to this book because of the contemporary look and feel of it. The more traditional designs I've seen so far don't really do it for me so if I don't win a copy, then I'll definitely go out and buy one. Thanks for sharing it with us! Hii Mary..Happy to hear about the new give away.. What I like about his book from your review is that it is full of grt ideas and small projects.. There is much to like in this book. The "very current" ways to use crewel work in projects for today is what I like best. It helps "oldsters" get a grip on what is popular now; and motivates "youngsters" to take up the art. Thanks Mary, for sharing about the book and for giving one away. I love the fact that although I love Jacobean crewel work, this book has a modern twist to crewel. Love it! I love the contemporary designs in the book and being a beginner, the easy description and pictures of the stitches will be invaluable to me! Thanks, I hope I win!! Thanks for the chance in the give-away! The book sounds great and what I like best is that there are little projects. Good morning! This book just so reminds me of my daughter and the way she likes to decorate. She's an art student and moving into fabric and thread mediums. This would be a wonderful gift that I wound give to her to encourage her needlework. I have enjoyed stitching so much over the years–I hope she fully discovers the magic too! Oooh, I would love this book! It has some really nice designs for pillowcovers, small bags, you name it! Gwen Kok from Dordrecht, the Netherlands. Count me in, and thank you for the opportunity. What I like best are the color pictures and the inspiration I get from the author's style. Thanks! I've borrowed this book a number of times from my library and would love to own it. It is full of inspiration and wonderful colors and shapes for needlework and artwork of any kind! Thanks for this opportunity. I just discovered your blog via a search for information on trebizond silk thread. I appreciate the information! This looks like a fun, "alternative" design book to play with an age old embroidery technique. I love the funky, fun designs. Thank you so much for offering this give a way. It would be exciting to use a such a traditional form of embroidery for such up to date designs. Mary, I love the "modern" designs and projects outlined in the book. Perfect for stitching little goodies for my very modern grown children. The titles given to the designs are great also! I love crewel work, but am not fond of the traditional patterns and usages. Most crewel work is at least pillow size and I prefer to work in smaller dimensions. The wonderful, small designs would be perfect to use on a crazy quilt, allowing me to use yet another "unusual" technique in my crazy quilting. The book gives one the techniques to convert many unusual designs to crewel work. I really like this book! I can see adding flowers to some of the designs for a applique look. Using funky flowers. It just makes my head spin with ideas. Thanks for offering the free give away. I would love a chance to win this book! I have eyed it before on Amazon. I really like the simplicity and graphic elements to the designs. Also, I'd like to try more crewel work. Hi…. embroidery includes patience, kindness and love that is mostly what we see in this book, the little budding love and becoming a beautiful art. I like that Shaughnessy includes the history of crewel embroidery. With many 'modern takes' on historic crafts, they neglect the history, which is similar to deserting your parents to raise children. I think it's important to preserve the legacy of our predecessors, it serves as a gift for those who will come after us. I recently found your blog from your Flickr photostream; I love looking at your embroidered flowers! This book would be an excellent addition to my very new collection of embroidery supplies and how-to's. I just started embroidering about 8 months ago, and I'm completly hooked!! Thanks for the opportunity to enter. It's such a wonderful giveaway! I love that the designs are fresh and flowing, and would certainly add a new element to my work. It's inspiration in a book. I am new to Crewel. However this book seems to be different from the traditional Crewel books on contemporary patterns that looked like they are emotive. Thank you for giving a chance in participating this book give away. Good luck everyone. I always wanted to do crewel but never got around to it – other projects always got in the way. I like this book because it has all the information novices like me would need. I also like the contemporary feel of the book, even though crewel has been around for centuries. Thanks for hosting the give-away. Great giveaway! The modern designs are perfect for making gifts for my modern children. Thx for having this giveaway! I like the crewel shown in your picture PLUS it is small — not a lifelong project!!! I love the funky projects! Very hip. I like the simple lines of this book. I can see some of the designs on the front of blouses, jean pockets and accessories. I love embroidery and this book would be a treat to have. Thanks for the chance, Mary. I love the wool/crewel, and love taking embroidery into new areas of expression. This book looks intriguing that way! I've taken this book out of the library a couple of times now and just love it. Smaller projects are a great way to introduce yourself to crewel as it looks simple but to do it well takes practise (like most things in life). It's a great intro to a wonderful technique. dawn. Wow.. another wonderful giveaway. You have the best giveaways! I love crewel embroidery and smaller projects will be a great start for me to learn crewel. Thanks for giving us an opportunity to win such a great book! The thing that I like best is that it has a very fresh and modern style to it – youthful and independent. I love historical work, but there is something to be said for recreating techniques to complement current design. I think I would end up making lots of jar tops for all the mason jars I have full of buttons, bath salts, rocks, dried flowers, etc. i make most of our gifts for others. being somewhat of a traditionalist there are times when i am just stumped as to what to give to a few of our family and friends who ar not. looking at the pages you showed us, i dom't thimk i would be stumped again. please enter my name in the drawing. oh, and by the way april 19 happens to be my birthday. I love the pictures in this book. I am still a beginner at embroidery, but would love to learn more! I love the modern designs in this book. Really fun stuff! Thanks for the chance to win! At last, a beautiful AND contemporary book on crewel. What's not to like? I especially like the historical section and the gallery section – very refreshing to see traditional techniques like this in such modern designs. Marvellous. If I don't win a copy, I'll save up and buy one myself! From your description of this book….how delightful!! It appears to have a rare combination of modern/simplicity and (for me, most important) charm. Thanks for an opportunity to win. I love trying new things and have never tried this kind of embroidery. Plus, the designs were really neat looking. I have an eclectic taste and they looked interesting. Thanks again. I really like the designs that I can see. They look simple enough and then will probably progress to something more complex. I hope to step up my embroidery abilities…I need a lot of practice! These designs will help me out! I like the idea that the book is a smaller size; that it contains good, clear instructions and that the projects available are a smaller size for beginners to crewel embroidery. Thanks so much for another beautiful give away. I have not done crewel work and would like to give it a try. Winning this wonderful book would be a big help. Thanks again for such a lovely web site. I've been doing cross stitch for years, but your blog and newsletter have inspired me to go back to the type of embroidery my grandmother taught me. This book had just the right kind of projects to get back into crewel. I enjoy your blog very much. What I love best about the book is that it has gotten me interested in crewel work! I've never really been interested in trying it until I saw this book. I love the modern style. I love how simple the projects look. This beaut book is quirky, like me! What I like about the book is that it is new. I have a few crewel books, but they are very outdated. I would love to see how an old technique are used in new ways. I like that it is contemporary embroidery. I am really drawn to that. That's for the opportunity to win the book. Thanks for the chance to win this beautiful book. I Love the way it wives ideas for the modern use of an old technique. I love the idea of learning a new form of needlework. I've never done crewel and the styling of these photos is right up my alley. Graphic, modern… I love it! I look for inspirations and I think this book is perfect for this.And the colors and stitches,for example could help me to learn and share with my group. The thing I like best about it is it's whimsical look. It's very cute. Thanks for the opportunity to win. Hi Mary another great book giveaway. I love small and qiuck projects. And best of all that they add bead work. embroidery, crewel, beads, and more… you tickled my stitching bone. I'm so happy to see that crewel is coming back again. I enjoyed it years ago and a new book of more up-to-date patterns would be a fun addition to a library! Thank you, as always, for your fun giveaways. I like that it focuses on small things and not huge areas. It's so nice to see bits of embroidery in places one would not expect. Another great giveaway book, Mary. Years ago I used to do a lot of crewel embroidery, mostly kits. I still have all the leftovers from the kits, plus skeins of crewel wool. I'd love to see what the author has done in a contemporary style. Might make me dust off those boxes of crewel wool! The best thing for me about this book was the Ruby Shoots photo. I loved the curves and flowingness of the trees. I also love your book reviews. Your comments and the pictures always show a bit more than the publishers or online bookstore reviews which I find make it a lot easier to decide on buying a book or not. First I have to say…Even though you discussed how you do all you do, I am still in awe you are able to do all you do…I suspect, enven if you had little ones running around you would still be able to manage it all. As for what I like about the book, I like that it isn't at all traditional. I love traditional needlework, but I also like to see how other people are able to mix it up a bit. I like the miniamilist aspect of the designs. They are simple enough that my grandchildren would be interested in stitching with me. What i love about this book is that it has quick projects that i can do inbetween my revision for my gcse's. Also because it's something different i'd really like to try out. Hey 🙂 I like to present people with things I made and sometimes I just can't come up with new and original ideas. The mother's day is coming and still have no idea what to give 😀 I like this book because there's new type of embroidery that I haven't tried yet and I want to learn, and there are cute projects that could inspire me. Also there's history of crewel work – the part I'm particularly interested in. I belong to medieval club and I sew and stitch a lot. I've started just a year ago and there are many new things I need/want to learn, for instance – crewel work. I believe that this book would be very helpful for me. Thank you very much for one more wonderful give-away. I am trying crewel embroidery at the moment. What I am interested in this book: small, not very difficult projects, useful for learning. I like this book because of its modern attitude to embroidery. For some people embroidery might mean some old-fashioned design that can appeal grandmothers but not younger generation. This book proves it's not like that and in fact we can embroider also the pieces that will suit the modern design. I love the whimsical organic designs this fantastic book showcases. My fingers are crossed. Way too cool! Loved the designs. A new and unique way to embrodiery…. beautiful, magical threads in my hands.